Everyone knows that Halloween is for the kids but isn’t there a kid inside each of us and it’s just dying to get out! BisketBaskets.com realizes this and has designed a great selection of Halloween gift for kids, adults and even our beloved canines too! So there’s no reason to be sneaking around the house after midnight going thru the kids treats looking for those beloved Reese’s Peanut Butter Cups or the Skittles; we can design a special gift just with those favorites or how about a bouquet of just OREO COOKIES?? Now even I am getting the munchies! Celebrate the holiday, be safe, take the kids to only the neighborhoods you know but leave their snacks in the pillowcase or pumpkin head alone and send yourself, your adult friends and family members a Halloween Gift all for themselves to devour; just like Zombies gulp brains! It’s the time of Ghosts and Goblins! In about two weeks your neighborhood will become filled skeletons, ghosts, goblins and perhaps even some Snoopy Red Barons! Fill their dreams and goodie bags with a special Halloween gift from Bisket Baskets and YOU! We have Halloween gifts for dogs, pet lovers and even Halloween gifts for friends, family and co-workers. All our gifts deliver right to their doorstep and are sure to make even Frankenstein smile. Halloween is a time for fun costumes and sweet treats. Instead of sending a card or a bag of candy to your favorite ghoul, send them something fun! Bisket Baskets candy and cookie bouquets have been given a Halloween makeover. We’re sure you’ll have a hard time choosing just one, but here are our three favorites. This Haunted Fun House Candy BOO-quet has a mix of chocolaty treats fit for any treat bag. 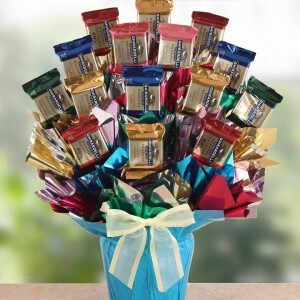 Hershey Kisses, Reeses Cups, and Hershey Bars galore make up this bouquet. It would make a great centerpiece for home or as a conversation piece at the office. You can’t find this trick or treating! The Halloween Cookie BOO-quet combines our classic cookie bouquets with the fun of Halloween. These Jack O’Lantern and Frankenstein royal iced cookies are festively arranged and ready to eat! Do you have a trick or treater who really loves M&M’s? Well we have the BOO-quet for them! The Halloween M&M’s Candy Bouquet has an assortment of M&M flavors to cure any sweet tooth. It’s also arranged with a little bat who wants to wish you a Happy Halloween. 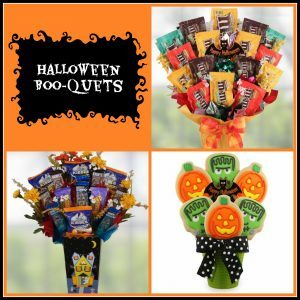 These BOO-quets are perfect for any Halloween lover. Be sure to order one soon so it arrives in time for Halloween! 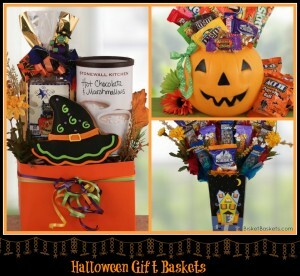 For more Halloween treats and gifts for all occasions, visit BisketBasket.com today! Get Spooky & Treat them with a Halloween Gift Basket! Double, double, toil and trouble – do we have a wicked spell for you! Trick-or-treaters will come knocking, but what about the special little ghouls in your life? Give them the ultimate treat this October 31st with a Halloween Gift Basket! Here are some of our most spook-tacular treat baskets to give to the trick-or-treaters that are near and dear to your heart this Halloween. Halloween M&M’s Candy Bouquet – The best of this deliciously chocolate Halloween candy is arranged perfectly within this basket. It’s perfect for the little ghoul or monster who loves this traditional Halloween candy! 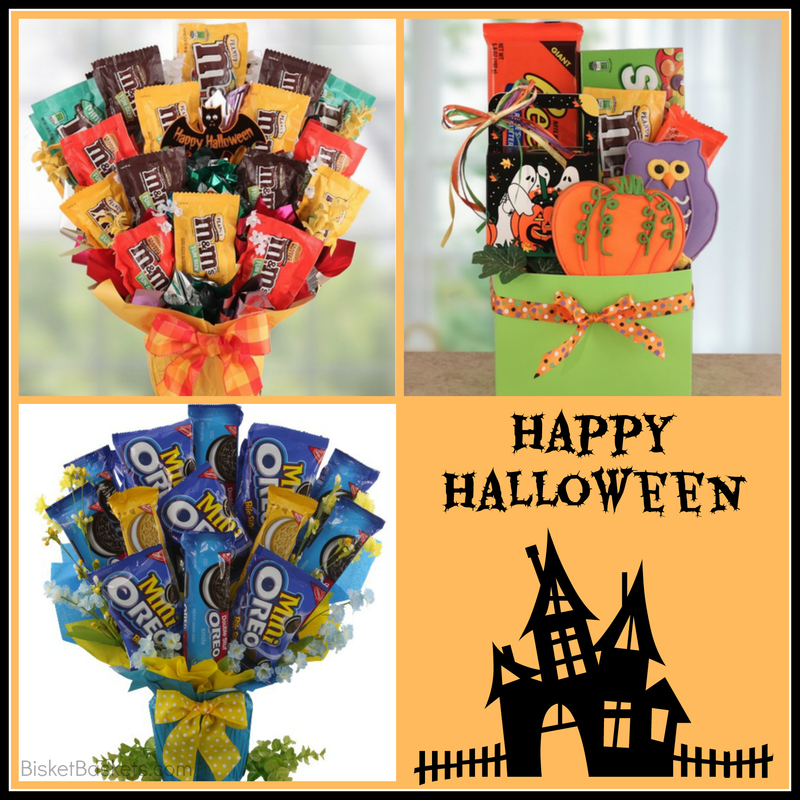 Oreo Cookie Bouquet – This Halloween gift basket is great for the non-traditional Halloween treat lover, and is a great basket to give to someone who maybe isn’t into candy. It’s also the perfect Halloween gift to give the person who loves snacks. Ghost Crossing Halloween Gift – This delightfully scary treat box is filled to the brim with sweets! Complete with M&M’s, Reese’s, and plenty more – it’s sure to make the special trick-or-treater in your life feel even more special! Want to shop all of our Halloween Gift Baskets? Visit us today at BisketBaskets.com! October Means Spooktacular Halloween Gift Baskets! Give them a deliciously sweet fright this Halloween with one of our Halloween Gift Baskets! selection from our Halloween Gift Baskets! Want to know what kind of gift baskets we have to offer that will really be a spooktacular gift? Check out some of our favorite baskets below! Witch’s Brew Halloween Gift – “Double, double, toil and trouble” is what you’ll be whispering as you send this deliciously sweet potion gift basket to one of your friends during the Halloween season! This basket includes a Halloween-themed snack, hot chocolate mix with marshmallows, and an adorable Halloween cookie. It will have your friend cackling with delight when they receive it! Trick or Treat Pumpkin – Know a little one that’s celebrating one of their first Halloween’s all dressed up? Send them this Trick or Treat Pumpkin filled with delicious name-brand candy and snacks this year. It’s the perfect way to send them on their way this Halloween, even if you’re not able to see them in their costume! Haunted Fun House Candy Boo-quet – There’s nothing quite like walking into a dark, scary, haunted house not knowing what’s right around the corner. With sending them this spooky looking Haunted Fun House Candy Boo-quet, you’ll be sure to give them a good surprise full of delicious Hershey’s candy! 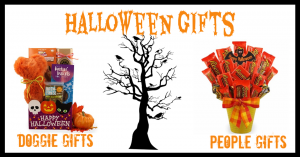 Want to see what else we have to offer in our Halloween Gift Baskets? Visit us today at BisketBaskets.com and see what else is in store for our Halloween-themed goodies! Halloween isn’t over when your child declares they are “too old” to dress up or moves away for college. It doesn’t even have to end when they bring their own children into the world or move halfway across the country to start their career. 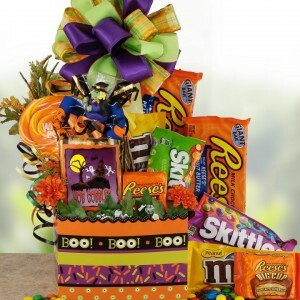 Halloween gift baskets for adults allow you to spook your favorite ghosts and goblins no matter where life takes them. You may even consider sending a Halloween candy care package to your office to keep employee morale high. There is nothing like a sugar high to increase productivity levels over the holiday season! Our Halloween care package is also the perfect gift for college students who secretly wish they were dressing up like Batman instead of hitting the books. Halloween gift baskets for adults are often appropriate for younger children if you don’t want them dressing up and roaming the streets to collect candy from strangers. You can give them all of their favorite treats in a festive bouquet, including a decorative container that kids of all ages enjoy. From Reese’s Peanut Butter Cups and Hershey Kisses to Starburst and candy corn, Halloween gift baskets, bouquets and care packages excite the sweet tooth of every spook in your life. Think of your best friend, your sibling or your favorite aunt going back to their childhood when they receive your Halloween treat. Take a look through our delicious offerings for Halloween gift baskets and send one to someone you love spooktacularly today! 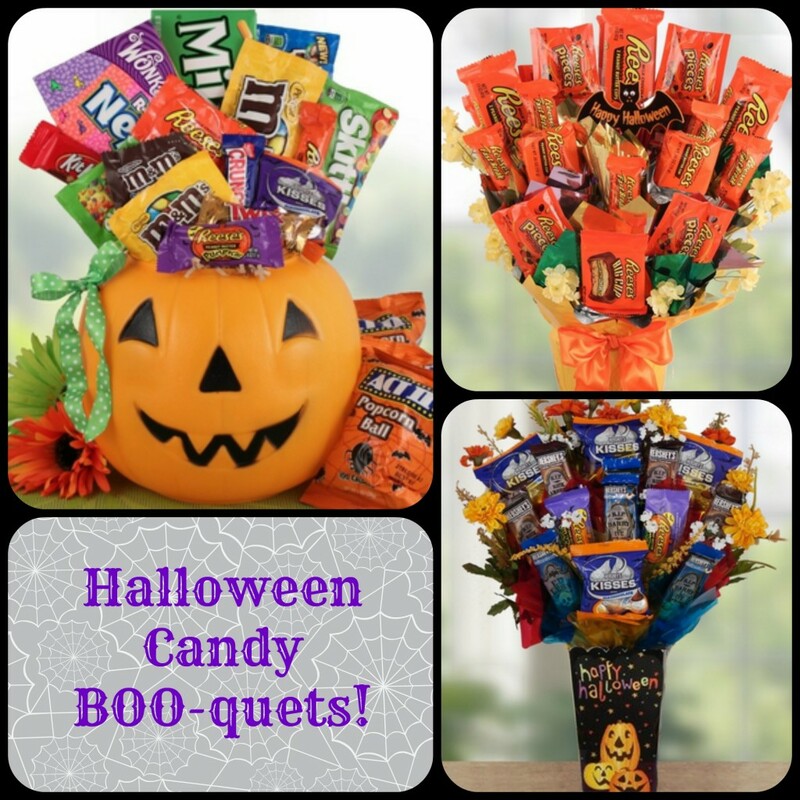 Make Your Haunted Attraction Even Better This Year with Halloween Candy Bouquets! I was fortunate enough to grow up in an area where Halloween was a very big deal. Starting toward the middle of September, and sometimes running into November, Halloween attractions big and small cropped up in surrounding towns like wildfire. While there wasn’t always something exciting to do most of the year, for a month-and-a-half there were more haunted houses, haunted hayrides, pumpkin patches and corn mazes to visit than we could keep up with! My friends and I all had our favorites based on a multitude of factors, and every weekend our parents took turns driving us to the next one on our list. While admission wasn’t always cheap, most of these haunted or Fall-themed attractions were run by local non-profits, including volunteer fire departments and animal shelters. The money we paid helped them with their yearly expenses, and we got a good scare, or just some seasonal fun, in the process. In order to raise even more money beyond the cost of a ticket, some of these haunted attractions hosted raffles, with the winner being chosen on the last day of the season. 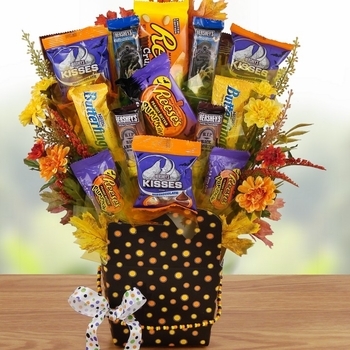 And those raffles are exactly what our Halloween candy bouquets would be perfect for! 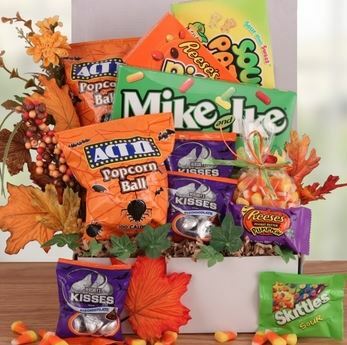 If you’re part of an organization that will be running a Fall or Halloween attraction or event this year, consider adding a raffle for one of our Halloween candy bouquets. You might be surprised by how many extra donations you can scare up! A Gift Basket for Yourself? Why Not! Most of us have at some point experienced the conundrum of trying to stay focused on shopping for a gift and instead finding something we wanted for ourselves. I know it happens to me several times every year when I’m out Christmas shopping, and I always feel guilty coming home with presents for me! But hey – it’s only natural to find things we personally like when we’re browsing several sites or shopping in several stores. And if we happen to pick up something small here and there, chances are good we deserve it. Despite my coming to terms with the fact that when I shop for friends’ and family members’ gifts I am likely to treat myself to something as well, I had never really considered buying myself a gift basket. Being surrounded by gift baskets every day, you might think we take home our favorites all the time, but we don’t! We do send our favorites as gifts fairly often, but I had never gifted myself with one. Until last Halloween, that is. As I was going on and on about the cuteness of a Halloween cookie bouquet for what must have been the tenth time that week, a coworker simply asked, “Why don’t you get one for yourself?” It was a simple enough question, but it caught me off-guard. A gift basket for myself, I thought? It seemed so indulgent somehow! But the more cookie bouquets I put together that season, the more that particular one appealed to me. I loved it, and I wanted one of my own. So – I did it! I got myself a Halloween cookie bouquet. And I set it on my kitchen counter, and I admired it, and I ate it. And I can’t wait to do it again this year! It’s no secret that many, if not most, of the people in our country are experiencing tougher financial times than they possibly ever have before. For those who were fortunate to start out this struggle with above average income, the impact might not be as severe. But for those who were already just getting by, counting their pennies to make ends meet, the consequences have been much more dire. Many of these people are hardworking individuals who never imagined they might need government assistance or outside help at all, yet they find themselves in a position where turning to others for help is not a choice, but a necessity. If you are like me and among the fortunate among us to be blessed with a good job, safe home, and full belly, I ask you to consider trying something this Halloween that we often reserve for Thanksgiving, Christmas and Easter. I’m asking you to think back on your own childhood, and if Halloween was as central a player in some of your fondest memories as it was in mine, to imagine how much a bag of candy might mean to a child whose family can’t afford such indulgences. A bag of candy is something you and I might take for granted, tossing it in the cart with the rest of our groceries without a second thought. But for children whose parents truly can’t afford to purchase anything beyond the essentials, that bag of candy is just one of their many wishes. The best route to take in donating candy might be to contact your local food bank and ask if they would be open to receiving candy donations, explaining that you would love for families with children to be able to take a bag home along with their food. If they are open to the idea, you might want to call on coworkers, neighbors or members of your Church to help you raise enough money to ensure as many families as possible get some sweets this season. A fun way to increase interest and offer others added incentive is to sell raffle tickets for one of our Halloween gift baskets. Everyone loves taking a chance on winning something fun and festive, especially when the money donated goes to such a great cause. To make the most of your candy money, keep an eye out for Halloween candy sales and coupons. You can also help stretch your budget further by checking out the offerings at stores like the Dollar Tree, which can have a surprisingly varied and tasty selection! Additionally, if you or someone you know has some Halloween costumes you no longer need, consider donating those as well. Costumes can be quite pricey, and not everyone can afford them for their children, which can prevent them from having the memorable and candy-filled opportunity to go Trick-or-Treating. Just think – you can clear some clutter from your closet, and help a child have a night filled with smiles and sugar in the process. Sounds like a pretty sweet deal to us!